Acl, Joan and Branka Baic-bender. "Douglas Cardinal". The Canadian Encyclopedia, 10 September 2018, Historica Canada. https://www.thecanadianencyclopedia.ca/en/article/douglas-joseph-cardinal. Accessed 18 April 2019. Douglas Joseph Cardinal, architect (born 7 March 1934 in Calgary, AB). 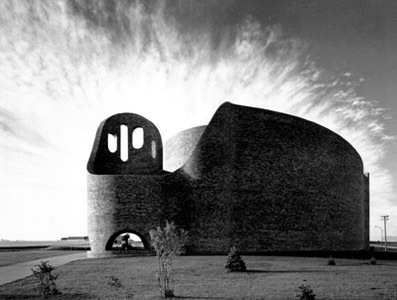 Designed by Douglas Cardinal in 1968, St Mary's Church reflects the rolling hills of the surrounding prairie landscape (courtesy Douglas J. Cardinal Architect Ltd.). Douglas Joseph Cardinal, architect (born 7 March 1934 in Calgary, AB). Recognized for his commitment to excellence and his unique creative vision, Cardinal is credited with creating an Indigenous style of Canadian architecture, characterized by gracious organic forms, which continually challenged the most advanced engineering standards. Siksika (Blackfoot) ancestry who was a forest ranger and game warden, and Frances Margarete Rach, a nurse, who was the daughter of a German immigrant and a member of the Morin family, a large Métis clan, Douglas Cardinal was the eldest of eight children. He grew up in mainstream communities and attended St Joseph's Convent Residential School near Red Deer, AB, where he was immersed in literature, and the fine arts of drawing and music. Accepted by the School of Architecture at the University of British Columbia in 1952, he studied there for three years. It was the University of Texas School of Architecture at Austin that provided the intellectually open, yet rigorous, training he needed to develop the complex, undulating architecture for which he is now internationally acclaimed. He graduated with honours in 1963. Like many of the renowned Western Canadian architects developing during the 1950s, Douglas Cardinal sought to interpret the teachings of European modernism by investigating a regional modification of the International Style. He was particularly influenced by Antonio Gaudi, Frank Lloyd Wright and Le Corbusier. His mature work harmonizes an attraction to Italian and Spanish baroque buildings with the expressionist arm of European modern architecture that reached its ascendancy in Germany just after the First World War. Cardinal was to synthesize his direct experience of architecture in Western Canada (Prairie expressionism, in particular) and the neo-baroque of Mexican church architecture, which he would encounter during his travels in the late 1950s, with his formal training in architecture and the history of architecture. This knowledge merged with his experience of the terrain of Western Canada, in particular the Plains and Alberta’s badlands, in the development of the curvilinear massing that is a signatory feature of his buildings. In Cardinal's architecture, principles of seamless unity, sustainability, community, green buildings and ecological design are interwoven with his strong sense for nature. The resulting designs are typified in award-winning projects such as St. Mary’s Church in Red Deer, AB (1965–68). His desire to integrate his architecture with these principles brought on experimentation with Computer-Aided Drafting and Design systems (CADD). It was during the construction of St. Mary's that the Cardinal firm began using CADD. By 1981, he was identified as a world pioneer and leader of CADD, and his firm was selected by the federal government as a demonstration site to test and advance Canadian CADD technology. Douglas Cardinal's principal public buildings include Grande Prairie Regional College in Grande Prairie, AB (1972–76), the Alberta Government Services Building at Ponoka (1977), and the St. Albert Civic and Cultural Centre at St. Albert, AB (1984, as well as numerous schools, all of which continued the curving wall exterior adapted to ever-increasing complex functional programs. Throughout the 1990s, Cardinal undertook a leadership role by providing architectural definition to the aims and aspirations of Indigenous communities. These projects included, among others: the Institute of American Indian Arts master plan, Santa Fe, New Mexico (1993); a master plan and design of principal public buildings for the Cree Village of Oujé-Bougoumou in Northern Québec (1994, which earned a United Nation's Award of Excellence for its sustainable designs and was celebrated at Expo 2000 in Hanover, Germany; Kainai Middle School, Blood Indian Reserve, AB (1995); and the Saskatchewan Federated Indian College (now First Nations University) master plan and concept design for expansion, Regina, SK (2003). 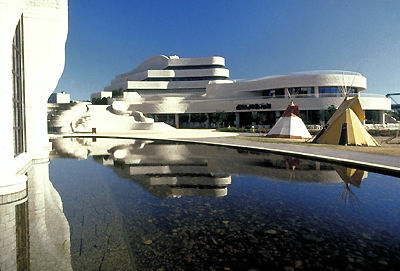 One of Cardinal's first projects outside Alberta and the Northwest Territories brought Prairie expressionism to central Canada through the design for the Canadian Museum of Civilization (now Canadian Museum of History) in Hull, Québec, inaugurated in 1989. Acknowledged internationally as a technologically complex building that reframed museum architecture, the CMC is a culturally significant building that was designed to accommodate a shifting perspective on Indigenous history and national culture at the end of the 20th century. In 1993, Cardinal was awarded the commission for the National Museum of the American Indian on the National Mall in Washington, DC, which resulted in an outstanding design, finished after Cardinal's exclusion from the project and surrounded by controversy. Other accomplishments include the design of the Cree Cultural Institute (2011) in Québec and the Meno Ya Win Health Centre (2010) in Northern Ontario. His works include several master plans, a student centre at the University of Saskatchewan, a stadium in Regina and prefabricated/modular housing. Cardinal has also designed a gallery to house the permanent collection of the great Indigenous artist Alex Janvier in Cold Lake, AB. These projects show how Cardinal's material palette has become much more varied, revealing his willingness to continually explore. In 1990, Douglas Cardinal was made an Officer of the Order of Canada. He was awarded the Canada Council Molson Prize for the Arts in 1992 and the National Aboriginal Achievement Award in 1995. In 1999, he was awarded the Gold Medal of the Royal Architectural Institute of Canada, the highest architectural honour bestowed upon an individual in Canada. He was awarded the Governor General's Award for Visual and Media Arts in 2001. In 2002, he received the Queen Elizabeth II Golden Jubilee Medal and the Diamond Jubilee Medal in 2012. By 2013, he had been granted over 12 honorary doctorates (by every major Canadian university) in recognition of his significant contribution to excellence in architecture. Douglas Cardinal's office is located in Ottawa. The Douglas Cardinal collection of drawings and models is archived at Carleton University, beginning with his work in 1984. Other material is in the University of Calgary Archives. Trevor Boddy, The Architecture of Douglas Cardinal (1989); University of Calgary, The Douglas Cardinal Architectural Drawings: An Inventory of the Collection at the Canadian Architectural Archives, University of Calgary Library (1997). Trevor Boddy, The Architecture of Douglas Cardinal (NeWest, 1989). Linda Fraser, comp., The Douglas Cardinal Architectural Drawings: An Inventory of the Collection at the Canadian Architectural Archives, University of Calgary Library, ed. by Kathy E. Zimon (University of Calgary Press, 1997). Canada’s Douglas Cardinal: an architect’s legacyAn article about renowned architect Douglas Cardinal and his innovative design for a major Aboriginal cultural centre in downtown Toronto. From thestar.com. Douglas Cardinal Architect Inc.This site features a biography of the eminent Canadian architect Douglas Cardinal and a gallery of his impressive architectural projects. Gravé dans la pierreCe site examine la conception unique de Douglas Cardinal pour le Musée canadien de l'histoire et propose une visite de photo du musée. Written in the StoneThis site showcases Douglas Cardinal’s unique design for the Canadian Museum of History and offers a photo tour that depicts the exterior structure from various perspectives.